Watch a short video describing the features and capabilities of Homeschool Planet. This is the video that appears when you sign into your planner the very first time. Learn about a few recommended first steps you should take with your new subscription to Homeschool Planet. This video gives an overview of Homeschool Planet with special emphasis on using lesson plans. 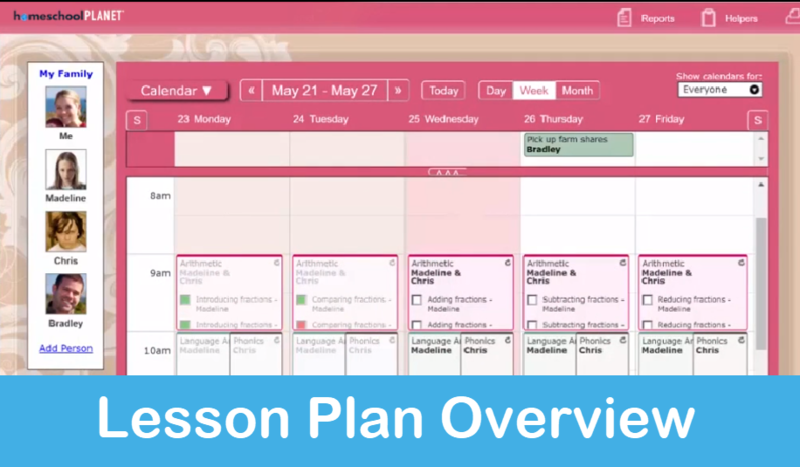 We have another video (below) that just focuses on using lesson plans. Or, click on the day in the all-day section at the top. Choose “Class” in the dialog that appears. Select the subject for the class from the Subject menu. Choose the student or students who will participate in the class in the For Whom menu. (Don’t include yourself – you’ll still see all the classes on your calendar). The default schedule for classes is once per week, on whichever day you clicked to begin. The Starting date, and the start and end times, are also taken from your initial click. If you clicked in the all-day section at the top, the class will be set to have “No particular time”. The class is initially set to have no end date. To change how often the class occurs, choose an option from the When menu. To change the Starting date, click on the date field and select a new date from the calendar that pops up. To change the start or end time, click on the clock icon next to the time, and choose the new time from the pop-up. If you change the start time, the end time will automatically update to keep the same duration for the class. Changing the end time will allow you to change the duration of the class. If you choose an end time earlier than the start time, the field will be shown in red, and you will be unable to Save your work until you choose a new time. To choose an end date for the class, click on the Until field, and select a date from the calendar that pops up. You don’t need to choose an end date now. You can edit the class later and choose an end date. There is a row for each day on which the class is scheduled in which you can enter an assignment for that day. To add more assignments to a day, choose “Add another assignment to this day” from the “More…” menu. The top section is for recurring assignments. Assignments entered here will appear every class day. You can hide the recurring assignments from the list by unchecking the “Show recurring items” checkbox. Rearrange assignments by dragging and dropping them. When you have more than one student in a class, some additional features are available. 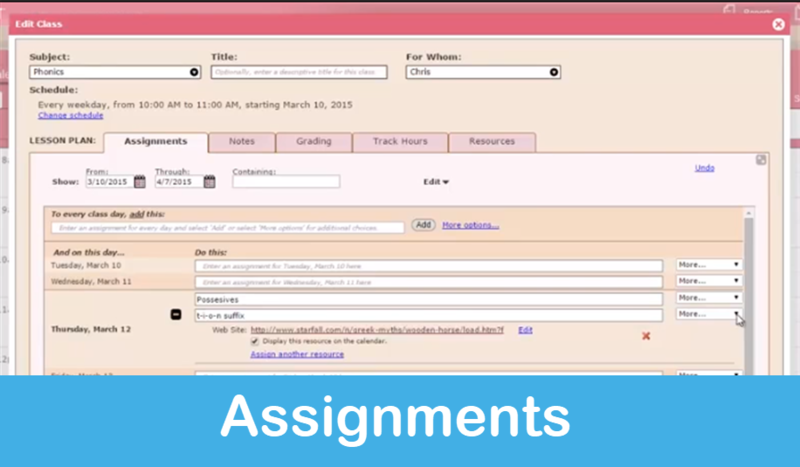 Assignments entered on the Shared Assignments panel will be assigned to all students. Assignments entered on an individual student’s panel will be assigned to only that student. The shared assignments are also displayed on each student’s panel, marked by a special icon. You can hide them by unchecking the “Show shared items” checkbox. You can edit the text for a shared item on a student’s panel. The text will be unchanged for the other students. You can drag and drop shared items on a student’s panel. The assignment will remain on the original date for the other students. Shared assignments that have been rescheduled for a student will have a red exclamation point over the icon. Watch the video above (9:25 minutes) to learn about the features for creating and managing your class assignments in Homeschool Planet. 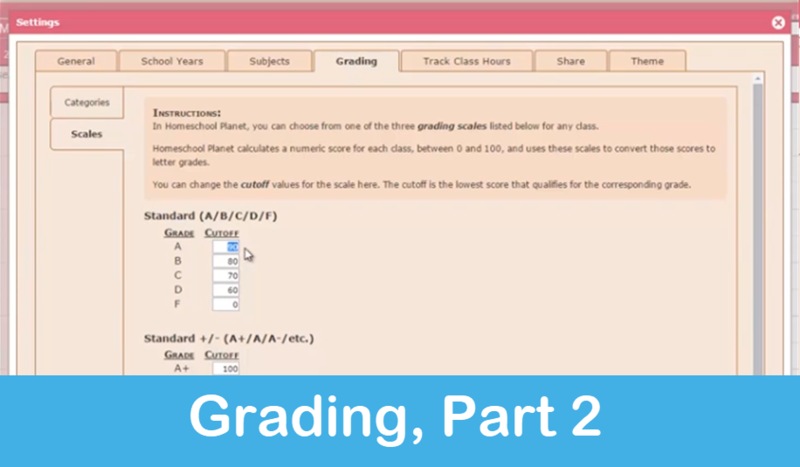 Watch the video above (3:40 minutes) for an overview of Homeschool Planet’s grading features. A more detailed video can be found in the “Advanced” section below. 1. After you have created a class click on the grading tab. 2. Click on the set up grading tab. * Choose the grading scale you would like to use. * Place a check mark next to the categories you would like to use. You can edit the categories if need be by selecting the add/edit categories. * Make sure the percentage equals 100 %. 3. 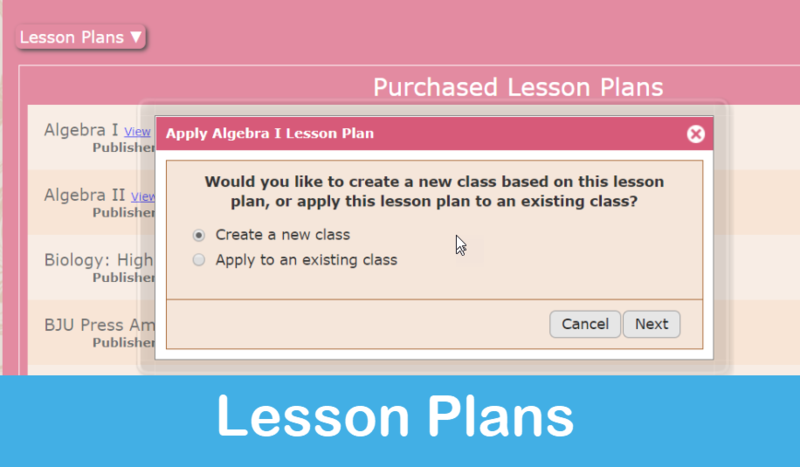 Once you select ok, you will see that there is a new category on the Lesson plan under assignments. In addition to seeing the categories that you created you will see one that says not graded, you will use that for activities that need to be checked off but not graded. 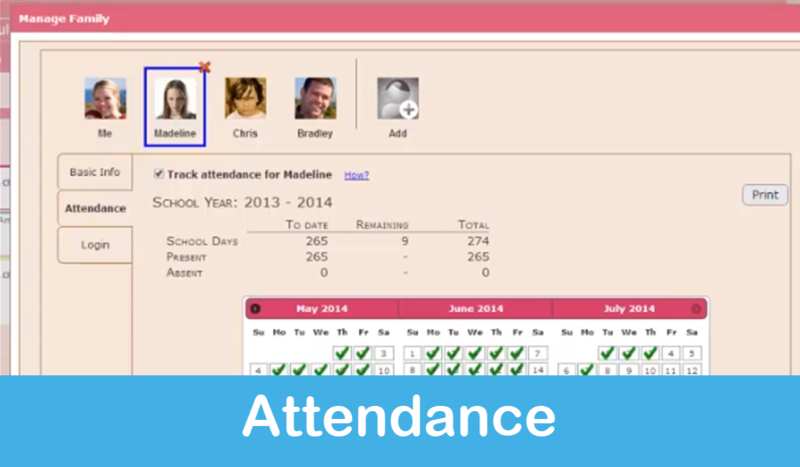 To enable attendance tracking for a student, first open that student’s profile (see How To: Edit a Student’s Profile). The controls for recording attendance will appear. There is one section for each school year you have set up (new sections will be added automatically as you create new school years in the future). At the top of each section is a summary of the attendance for the school year. The first column shows the number of school days elapsed so far, and how many of those were marked as present or as absent. The second column shows the number of school days remaining, and the third column shows the totals of the first two columns. Below the table is a calendar showing all the days in your school year. To save you time, Homeschool Planet automatically marks students as present each day. To mark your student as absent on a particular day, just click on that day to turn the green check to a red X. You can use the “Print” button, to the right, to print a copy of the summary table for your records. Once you set up attendance tracking for a student, you will find that Homeschool Planet puts a checkbox on the calendar to make it convenient to mark attendance each day. There is also a small calendar icon to the left of your student’s name; clicking that icon brings you directly to the Attendance tab for that student. Watch the video above to learn about the features for creating and using resources (e.g., textbooks, websites, etc.) in Homeschool Planet. Record the resources used for a class, by choosing Resources from the menu on the left. Add a resource by clicking the Add resource button. Choose what type of resource you want to use. Each resource type allows you to add the information relevant for that type of resource. The required fields are marked with an asterisk. Enter as many or as few as you would like. For books, Homeschool Planet will fill in the information when you enter in the ISBN number and choose the Look up ISBN button. Once the information is loaded you can edit it as you like. 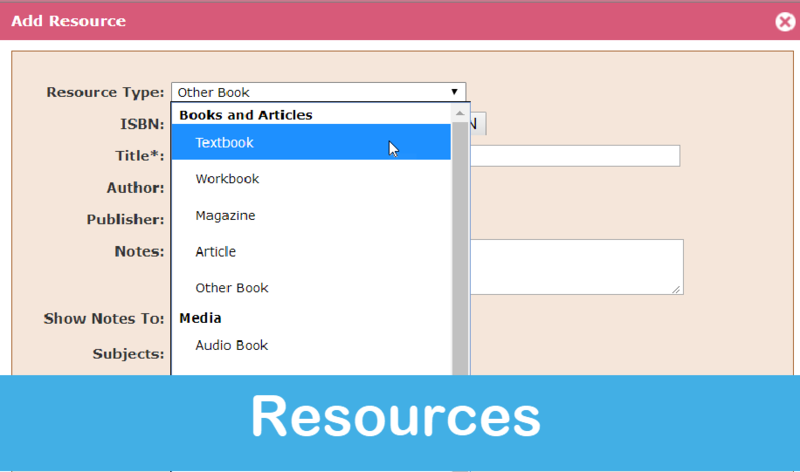 The list of resources can be sorted and grouped different ways using the button to the right of the resources tab. You can also search for a resource using the search field. You can edit or delete a resource using the edit/delete buttons on the right. The plus buttons next to the Titles gives all the information about the resource that you entered. When you no longer need a resource you can edit it and mark it as archived. This will hide it from your resource list but, keep it in your planner for your records. You can click on the Show archived resource box anytime you need to access your resource. When creating or editing a class you can use the resource tab to add resources used by the class. Each resource assigned to the class will be displayed in the calendar everyday the class appears. You can limit how long the resource appears by changing the from and to dates. Or you can choose not to display it on the calendar at all. If you change your mind you can remove the resource from the class with the red x. If there is a resource that is for a specific assignment you can add it by picking the add a resource from the More menu. This resource will be displayed below the assignment on just the one day the assignment appears. One resource that you might use often is a website. You choose web site option in the resource type. It will automatically check the archive button so it will not show up on the resource list or another assignment. To print a list of the resources, go back to the resource page and click the print button. You can make some layout choices using the controls on the left. When it looks the way you want it, hit print. 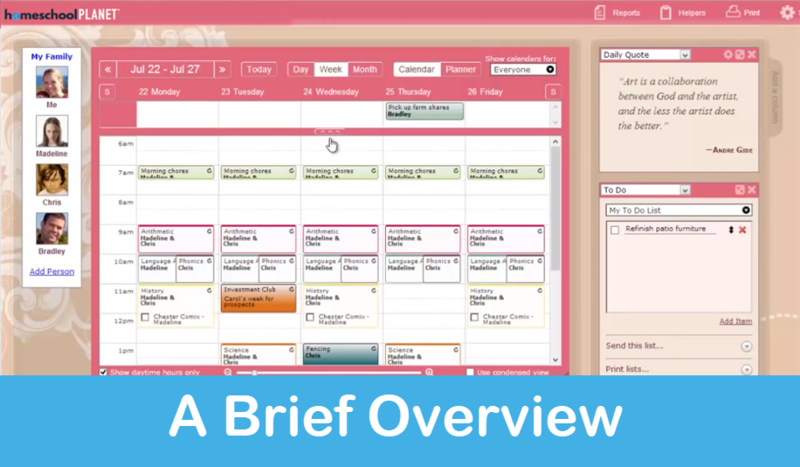 Watch the video above to learn how to apply lesson plans to your schedule and use them. If you acquired one of the official Homeschool Planet Lesson Plans, you will find it in the Lesson Plans on the pull-down menu on the left side. You can use it by clicking on the Apply this lesson. You will select the subject for this class. You can use the add a subject link if the subject you want to use is not listed. Choose the students who will use this class. Hit next. Choose the dates and times you want this class to run. Homeschool Planet will warn you if there are not enough school days to fit the assignments in the lesson plans. You will be given options on how to schedule the assignments. Click next. Some lesson plans have suggested grading. If you are not using Homeschool Planet to track your grades we suggest you choose no. Otherwise we suggest that you use accepted the suggested grading. You can make changes to your grading once the class in on your calendar, and that is easier that trying to set up grading here. Homeschool Planet then builds your new lesson plans , when you press ok it shows you your new class on that you can treat just like any other class. If you edit the class you will see that all the assignments, resources, and grading information that you will need. 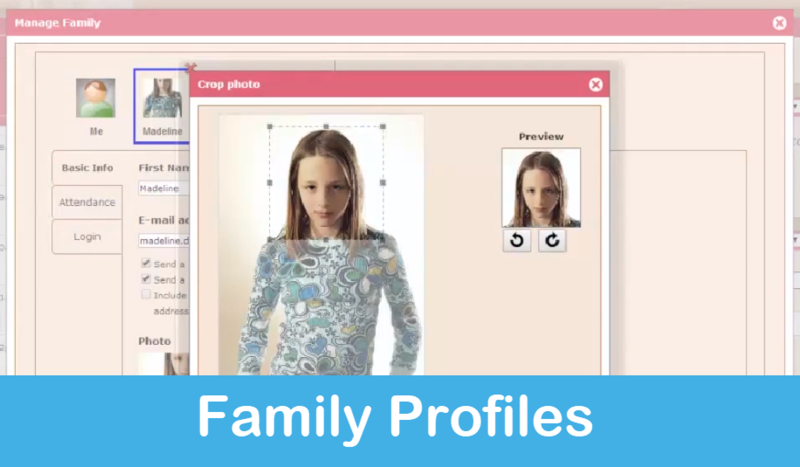 Watch the video above to learn how to set up profiles for each of your family members in Homeschool Planet. Edit the student’s profile, by clicking on his or her picture in the “My Family” panel and choosing “Edit Profile”. Select the “Login” tab, on the left side of the profile window. 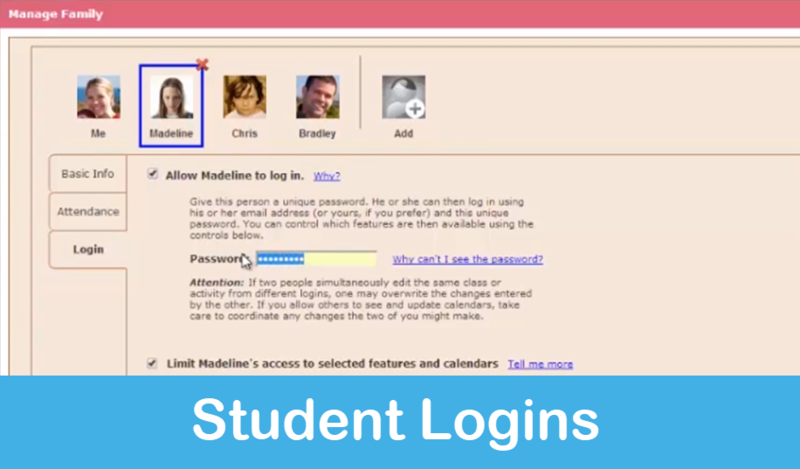 Make sure that the “Allow this student to log in” box is checked. Enter a unique password for this student in the Password field. Initially, students are allowed only to view their own calendar (and to mark assignments as completed). You can allow them to edit their own calendar, and to see or edit other students’ calendars, by checking the appropriate boxes at the bottom of the Login tab. Also initially, students have access to the “widgets” feature, allowing them to select and configure any widgets they choose. You can disable the widgets from the student’s login by unchecking the “Allow this student to see and update widgets” box. 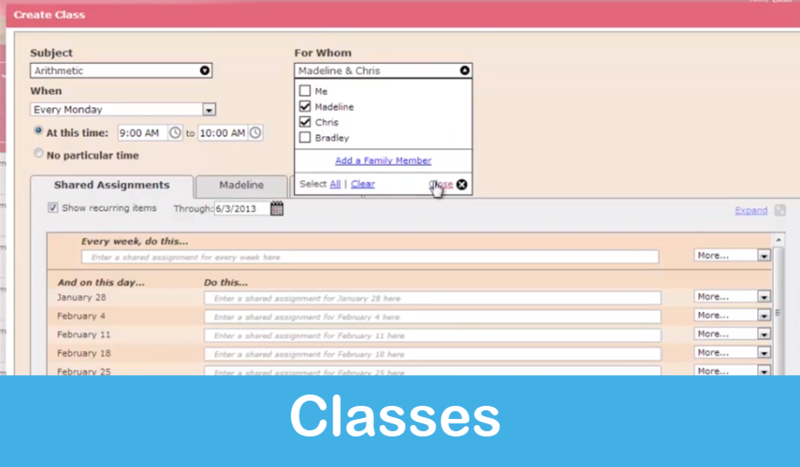 Watch this video to learn how to search for classes and assignments in Homeschool Planet. 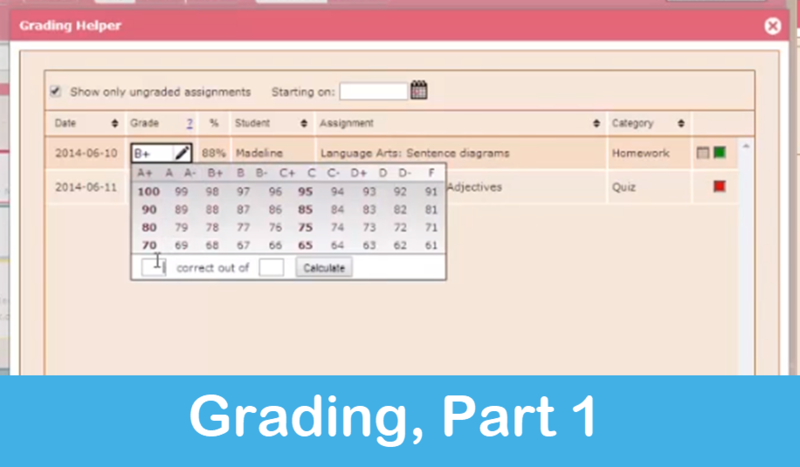 Take a deeper dive into Homeschool Planet’s flexible and powerful grading features. Suppose you use Homeschool Planet, your spouse uses Google Calendar, and your high school student’s Calculus Co-op teacher uses Apple iCal, and you’d all like to see your student’s class schedule in your respective calendars. 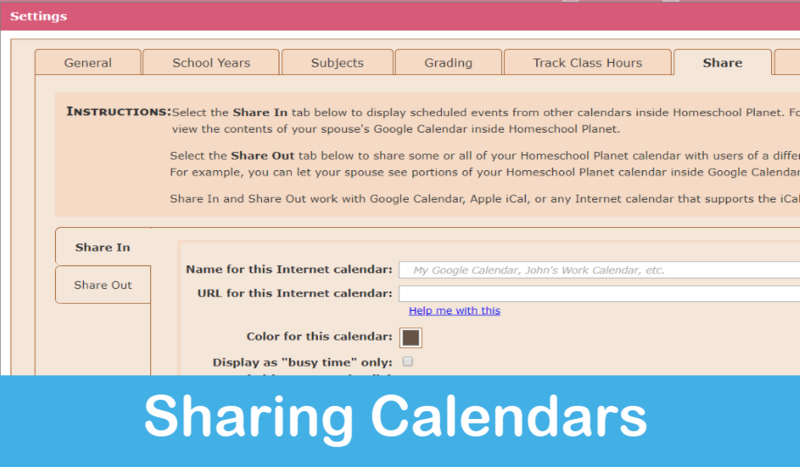 You can do that with Homeschool Planet’s Share In and Share Out features. Watch this video for more information. 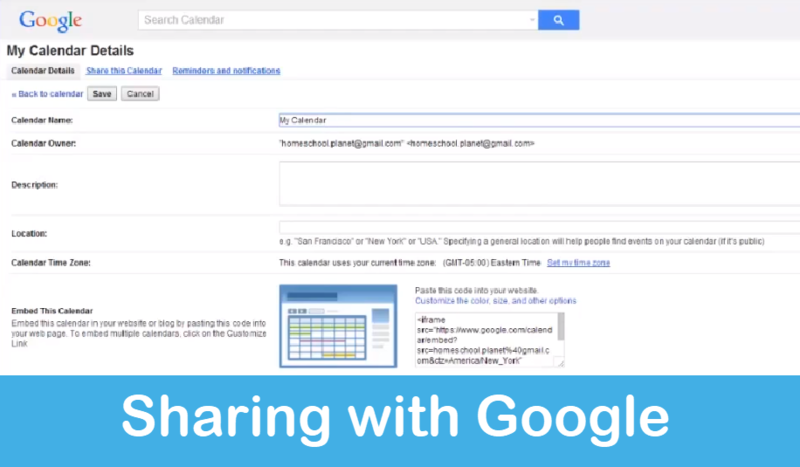 This video shows you how to find the URL you need to display yours or someone elses Google calendar in your Homeschool Planet calendar. What do you do when life happens and you can’t teach your class on a given day? 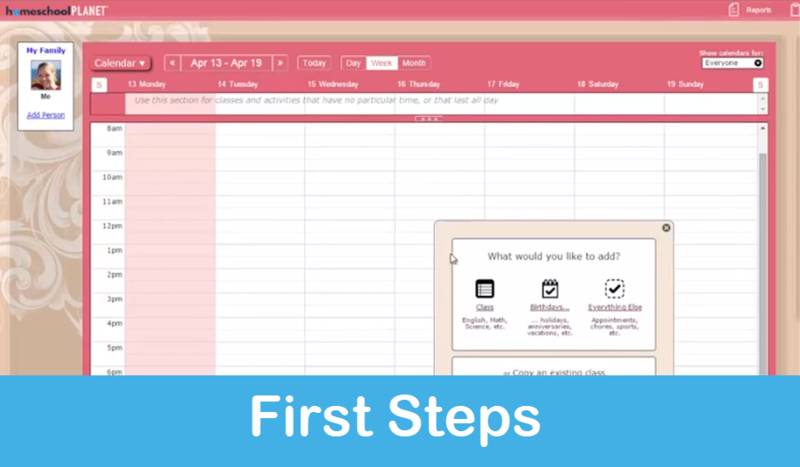 Watch this video to learn severals ways you can reschedule that class with just a few clicks. Our Lookup Widget is a convenient way to simultaneously search a number of Internet resources for information on a particular subject. Studying Abraham Lincoln? Use the Lookup Widget to simultaneously search Wikipedia, Amazon, and Google for information on Abraham Lincoln.